Definition: Chickenpox, also called varicella, is a viral infection that causes an itchy rash of spots all over the body and flu-like symptoms. It is a highly contagious infection caused by the varicella zoster virus (VZV). The disease results in a characteristic skin rash that forms small, itchy blisters, which eventually scab over. It usually starts on the chest, back, and face then spreads to the rest of the body. Complications may occasionally include pneumonia, inflammation of the brain, and bacterial skin infections. The disease is often more severe in adults than in children. Symptoms begin 10 to 21 days after exposure to the virus. The disease can usually be diagnosed based on the presenting symptom; however, in unusual cases, it may be confirmed by polymerase chain reaction (PCR) testing of the blister fluid or scabs. Testing for antibodies may be done to determine if a person is or is not immune. People usually only get chickenpox once. For most people, chickenpox is a mild disease. Still, it’s better to get vaccinated. The chickenpox vaccine is a safe, effective way to prevent chickenpox and its possible complications. Pregnant women, newborns, or anyone with a weakened immune system (for instance, from cancer treatments like chemotherapy or steroids) who gets chickenpox should see a doctor right away. 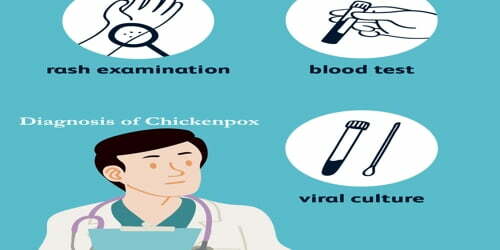 Diagnosis and Treatment of Chickenpox: The diagnosis of chickenpox is primarily based on the signs and symptoms, with typical early symptoms followed by a characteristic rash. 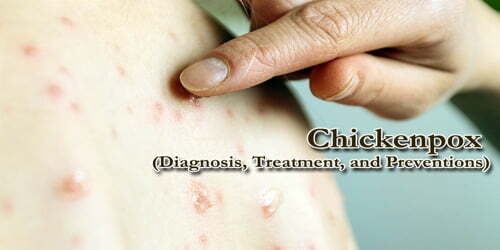 The doctor may be able to diagnose chickenpox based on a physical exam of blisters on people or their child’s body. Or, lab tests can confirm the cause of the blisters. Blood tests can be used to identify a response to acute infection (IgM) or previous infection and subsequent immunity (IgG). Vesicular fluid can be examined with a Tzanck smear, or by testing for the direct fluorescent antibody. The fluid can also be “cultured”, whereby attempts are made to grow the virus from a fluid sample. Most people diagnosed with chickenpox will be advised to manage their symptoms while they wait for the virus to pass through their system. Parents will be told to keep children out of school and daycare to prevent the spread of the virus. Infected adults will also need to stay home. An antiviral medicine might be prescribed for people with chickenpox who are at risk for complications. The decision to use this will depend on a child’s age and health, the extent of the infection, and the timing of the treatment. It is important to maintain good hygiene and daily cleaning of skin with warm water to avoid secondary bacterial infection. Scratching may also increase the risk of secondary infection. If people or their child falls into a high-risk group, the doctor may suggest an antiviral drug such as acyclovir (Zovirax) or another drug called immune globulin intravenous (Privigen). These medications may lessen the severity of the disease when given within 24 hours after the rash first appears. Paracetamol (acetaminophen) but not aspirin may be used to reduce fever. Aspirin use by someone with chickenpox may cause the serious, sometimes fatal disease of the liver and brain, Reye syndrome. Acetaminophen (Tylenol) can be used at any time during pregnancy. Other antiviral drugs, such as valacyclovir (Valtrex) and famciclovir (Famvir), also may lessen the severity of the disease, but may not be approved or appropriate for all cases. In some instances, the doctor may recommend getting the chickenpox vaccine after exposure to the virus. This can prevent the disease or lessen its severity. It is important to drink plenty of fluids, preferably water, to prevent dehydration. Some doctors recommend sugar-free popsicles or Pedialyte for children who are not drinking enough. 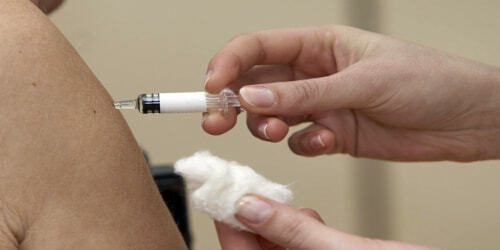 Preventions: A vaccine is available for varicella. For children, 2 doses of the varicella vaccine are given, one at 12 to 15 months and one at age 4 to 6 years. These are 90 percent effective at preventing chickenpox. Give child acetaminophen to help relieve pain. The chickenpox virus is susceptible to disinfectants, notably chlorine bleach (i.e., sodium hypochlorite). Like all enveloped viruses, it is sensitive to desiccation, heat, and detergents. Since the chickenpox vaccine became available, studies have consistently found it safe and effective. Side effects are generally mild and include redness, soreness, swelling and, rarely, small bumps at the site of the shot.